When a school bus driver hit a car and allegedly fled the scene, a sixth-grader who witnessed the incident told the owner who was responsible. (CNN) - When a school bus driver hit a car and allegedly fled the scene, a sixth-grader who witnessed the incident told the owner who was responsible. 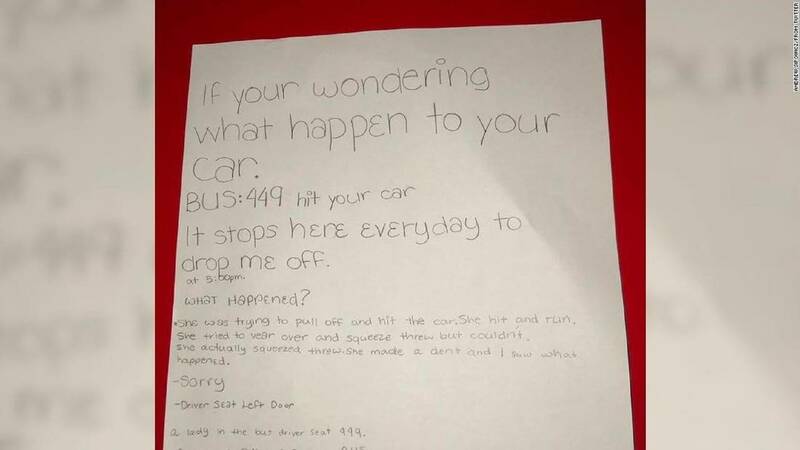 Andrew Sipowicz, a senior at Canisius College, in Buffalo, New York, said he checked on his car on Monday after his roommate told him a school bus was stopped next to it. Sipowicz found the damage on the driver's side of his 2012 red Ford Mustang. But he also found a note telling him how it happened. The note, signed by a "6th grader at Houghton Academy," let Sipowicz know it was the bus driver who hit his car. "She was trying to pull off and hit the car," the note reads. "She hit and run. ... She made a dent and I saw what happened." The sixth-grader, who appears to live close to Sipowicz and went back to the scene of the accident to place the note on his car, wrote "sorry" in the note and included a drawing of the school bus. Sipowicz shared photos of his dented car and the note on Twitter the next day. The post has garnered more than 750,000 likes as of Wednesday night. "Shoutout to the anonymous 6th grader for saving me a couple thousand (Bus not drawn to scale)," Sipowicz wrote. Sipowicz said that when he read the note, his "mood went from angered to more relaxed," adding he especially liked the drawing of the bus with children and the driver inside. "The detail of having two kids in the back of the bus yelling still makes me laugh when I look at it now," Sipowicz said. Sipowicz called the bus company, First Student, and a representative followed up the day after the accident to do a report. The company confirmed in a statement to CNN that representatives met with Sipowicz to initiate the insurance process. "We will cover the full cost of the repair to his vehicle as well as a loaner while his car is in the shop," the company said. First Student also said the bus driver will be terminated. Sipowicz said a teacher from the student's school reached out to him after recognizing the handwriting. Kevin Garcia, vice principal of Buffalo PS 69 Houghton Academy, told CNN affiliate WKBW the school will celebrate the student's "outstanding leadership" by presenting her with a citizenship award. Sipowicz also shared the update on social media, adding he's "very grateful" for the actions of the sixth-grader.